I had a bit of a scare last night with my neighborhood losing power while I was in the middle of watching The Evening Star. Thinking I'd be movie-less for the 2nd of April, I was lucky and it came back after around twenty minutes or so of sitting in silence and pondering my existence. The struggle of modern living eh? Anyway, this is still a part-Easter post. 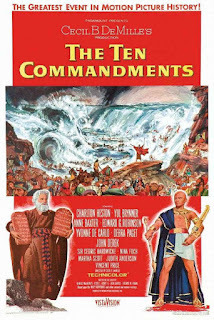 I say that because I'm still thinking about The Ten Commandments (1956) which has got to be one of the most entertaining epics of all time. For being as long as it is and as old as it is, it's aged superbly. Got to see Ben-Hur now one of these days. 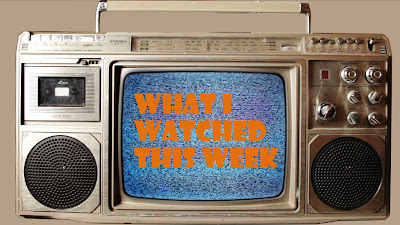 Now on to this week's WIWTW. Box office report: To no one's surprise, Batman v Superman: Dawn of Justice took the number one spot for this weekend in its second week of release. The thing is, we're talking about a 67% drop from last weekend which is pretty far from bulletproof. X-Men Origins: Wolverine is the only superhero film that can really be compared in this case and that fell 69%. Man of Steel for comparison fell 65%. Zootopia added $20 million to its domestic take and My Big Fat Greek Wedding 2 earned $11.1 million in its second weekend which is a decrease of only 38%. I guess we can look forward to more Greek-themed romantic comedies. Death at a Greek Funeral anyone? Video of the week: The filmmakers of Bridget Jones's Baby were so preoccupied with whether or not they could, they didn't stop to think if they should. SfP begins with the Spirit of Spring showing up to usher in the warm weather. 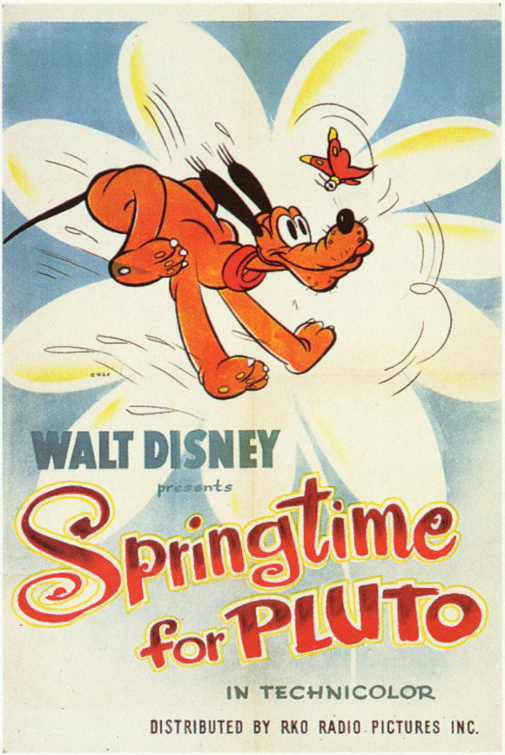 Pluto who's snoozing in his dog house wakes up and then gives us a pretty amusing march through nature as he takes in all the springtime beauty around him. Up until here we're good. There's even a small voiceover from Thurl Ravenscroft (How the Grinch Stole Christmas!) which is nice too. What derails this short for me personally is the appearance of a suggestive lady butterfly putting on a dancing show for the blushing Pluto. Not too sure who signed off on this sequence which lasts about 50 seconds or so, but it feels just a little bit out of place to me. Guess it's something for the adults. I had never seen a single frame of The Ten Commandments in my life (as embarrassing as that is) and boy did it feel good getting it off my watchlist. It's among the longest movies I've ever seen at 220 minutes which makes how entertaining it was even more amazing. I don't think there was a single scene that had me looking at the time because Cecil B. DeMille (who also directed the silent '23 version) always found a way to keep my attention whether it be by the acting, the mise en scène or even the dated special effects. 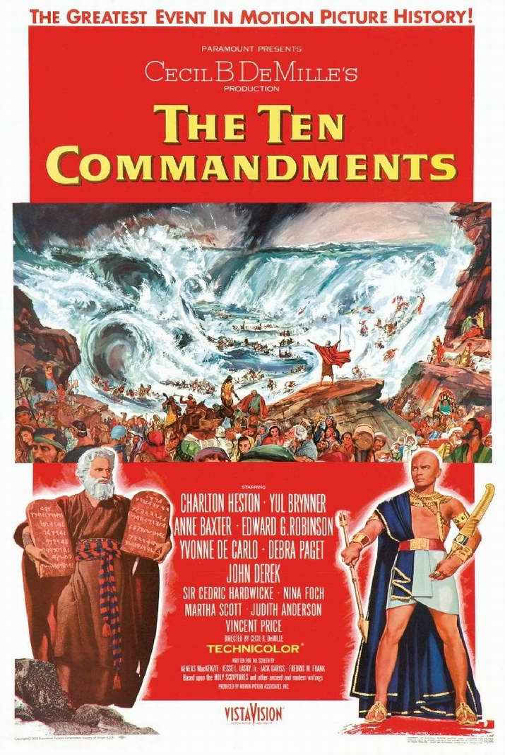 The epic story of Moses is given the best possible treatment and the character is given ample reverence by Charton Heston who commands the screen with absolute ease. Great seeing Vincent Price too. 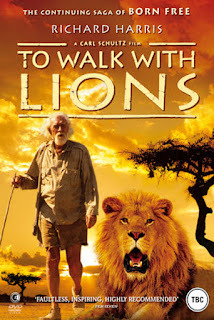 I like Richard Harris quite a bit and I like animals so seeing him act around lions seemed like a good fit. I unfortunately wasn't as enamored with this film as much as I would've hoped. John Michie's character gets a smidge more attention than Harris' George Adamson which is too bad as I never really felt the desire to care about him or his romantic subplot that felt a bit too Hollywood for my liking. I wanted scenes with lions and Richard Harris. While I did get that to a certain extent, the scenes in question felt pretty short and even badly executed at times. Still, this works pretty well as an animal activist film and it's Richard Harris after all which somewhat makes up for the film's shortcomings. 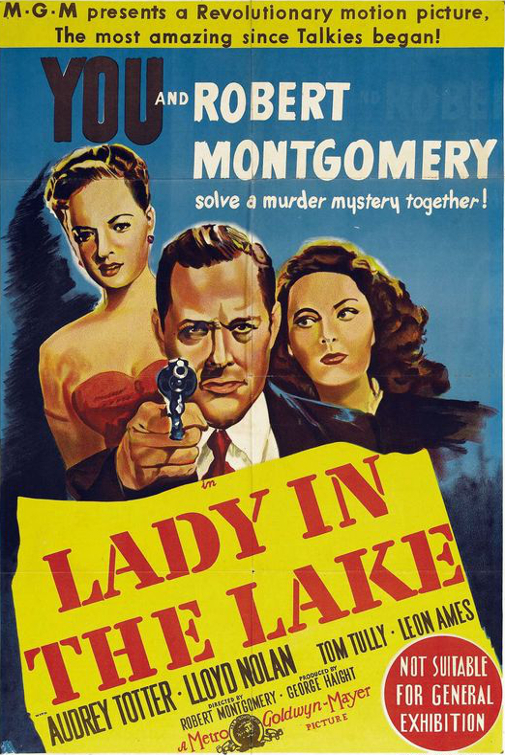 It might seem a bit silly, but the first person perspective of Lady in the Lake is just plain cool. While it's not quite pulled off to perfection and it's a bit hard to accept that we have to do without Robert Montgomery's acting in plain view, I couldn't help but be absolutely enamored with the effort. I couldn't help but grin as it felt as if I was the one messing around with Audrey Totter's Adrienne Fromsett or standing my ground against the nosy cops. The haunting vocal score is also very memorable. While the actors on camera come off as a bit unsure at times given their unusual perspective, Lady in the Lake is a truly interesting experience worth trying out if you like detective movies. 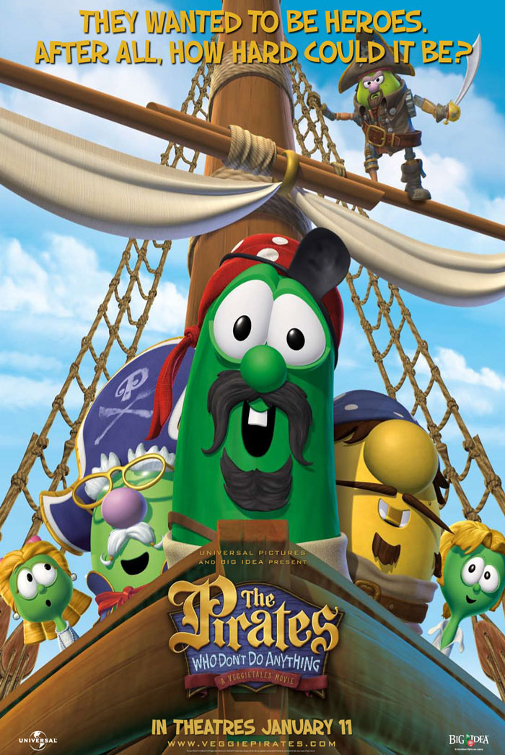 After loads of unwilling experience with VT, the first thing that jumped out at me is how "un-VeggieTales" TPWDDA is. 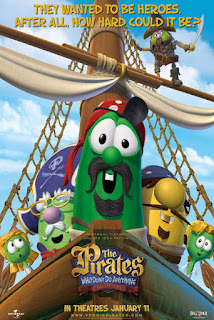 It nixes the common trope of the characters knowing that they're in a movie/show and it doesn't feature much of the quirky humour that the franchise is known for, instead going for more of a bland and generic brand of kid-friendly humour that doesn't do much to inspire any laughs. There's not a single mention of God which is surprising too, but clearly this was done to attract a wider audience. For me personally, TPWDDA is a bit better than the typical VT because it's more boring than irritating which is an improvement in a sense. 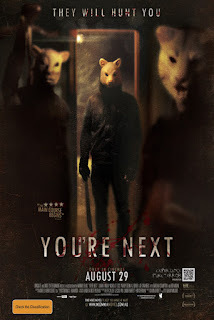 You're Next doesn't set out to do anything new with the slasher genre and that's perfectly alright. What could be done to bring something new anyway? Set in space? Point is, director Adam Wingard has a very good handle on creating tension and he's able to deliver some laughs on the side as well. Sure there are jump scares, but most of them are of the patient variety which partially makes up for that. Sharni Vinson makes for a great heroine and I was particularly appreciate of the 80's thing going on near the end. There's also more than enough violence to satisfy any gorehound. At the end of the day, You're Next is a satisfying slasher and I'd take that any day. 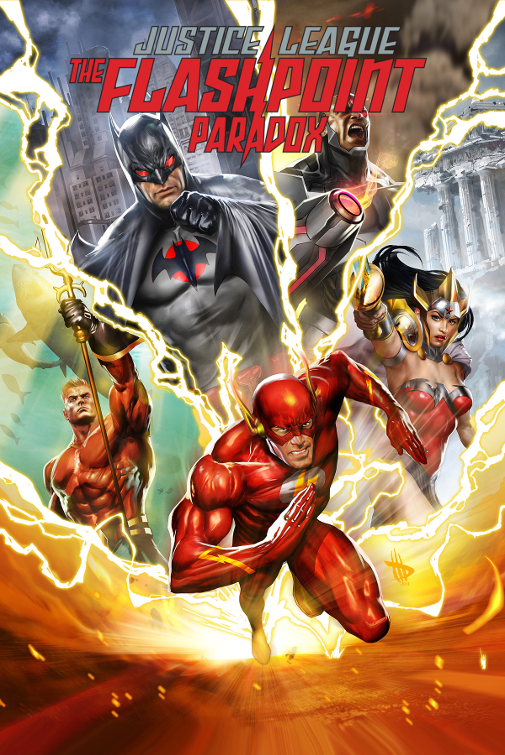 I'm going to just go ahead and say that The Flashpoint Paradox is one of the best DC Animated Universe movies I've seen. Most of them are middling due to their rushed nature and short running times, but here's one that runs at a steady 89 minutes (IMDb has 75 for some reason) which is just right. The animation is solid and the story seizes you from beginning to end. The violence goes maybe a little bit overboard and there's probably an overabundance of DC character cameos. That's probably something that will make DC connoisseurs drool though. Still, the action is entertaining, the voice cast impressive and it was nice having Flash at the center of everything. Some movies don't need sequels and Terms of Endearment strikes me as one of them. 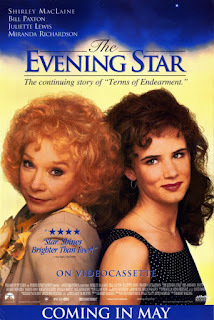 While ToE was a heartfelt drama that earned its tears, The Evening Star is a desperate wannabe weeper that unsuccessfully tries to emulate what worked in the original. It's easy to see through the script and the clumsy, sugar-coated dialogue during key dramatic scenes is unpleasantly sweet. There's the odd zinger here and there that works which is something I guess. 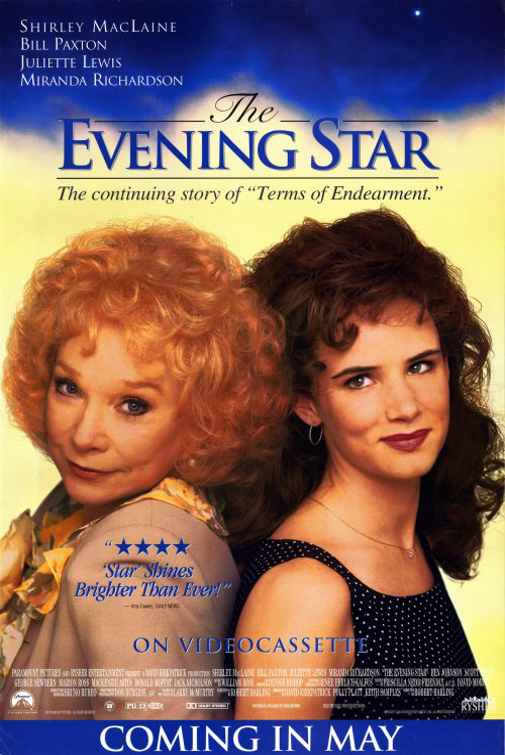 I don't think The Evening Star is a horrible movie or anything, but it's certainly disappointing to say the least. Fans of Terms deserved better or better yet, it would've been fine to leave a good thing alone.